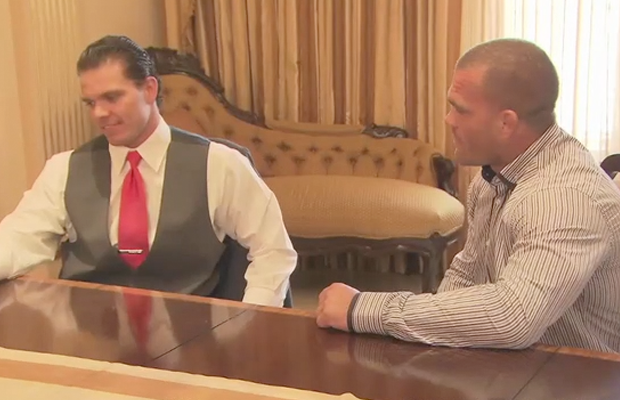 It’s almost showtime for Natalya and Tyson Kidd: their wedding day is upon us! This Sunday’s Total Divas will see the pair finally tie the knot, but even though we know they have a happy ending, that doesn’t mean we can’t have a little pre-wedding suspense, right? In a preview of the episode, we see Tyson spend some time with Brie Bella and Naomi and their beaus Daniel Bryan and Jimmy Uso. The tension is turned up to 11, though, when Nattie’s text message flirter Jaret shows up. Nice guy that he is, Jaret mentions that Natalya had spoken to him about her issues with Tyson’s family and reveals that they had been keeping in touch via text. Tyson make a bee line for Nattie, who’s already in her wedding dress (insert your superstitious gasps here! ), and doesn’t mince words: he’s pissed. The mid-season finale of Total Divas airs this Sunday at 9pm ET on E!.